In order not to be deceived by the imitation swords, it is important to get it used to seeing the swords photograph of this site and the enlargement of those details. This is considered to be the China fake. 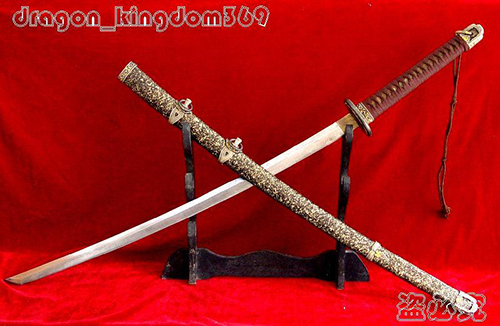 The accuracy which manufactures an imitation military swords Guntō is improving. Apparently, you will think a genuine article. This Guntō is forged markedly well compared with the former product. However, the decisive difference from a genuine article is immediately known only with these three photographs. What do you consider this fake ? If you do not notice the difference, it is lacking that you look at a genuine article photograph. Here, I do not point out a concrete difference. Since it may give an imitation contractor the hint of an improvement. In order not to be deceived by imitation, please see the photograph of my site well. 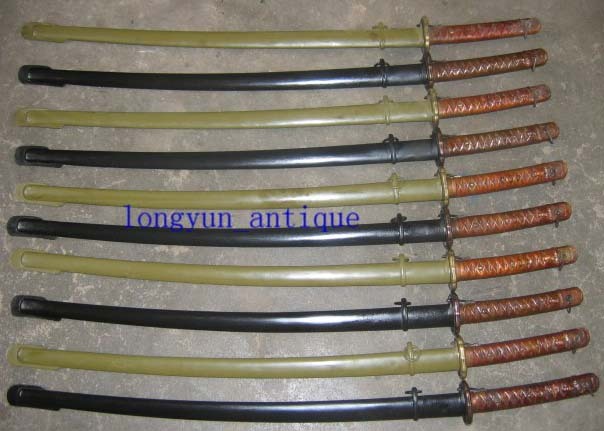 The type Tachi naval sword of the China fake. I protest against a seller severely. Delete immediately the photograph of my Guntō and a naval officer's photograph which are used for me without notice. I had honor damaged by you. Specify an apology sentence to the catalog of an auction. As for the imitation contractor, the sense of ethics is lacking. known immediately. There is no precision in their product. They completely differ from Japanese aesthetic sense.